It’s that time of year again when we start spending more time outdoors. Whether it’s relaxing in the garden or enjoying a meal with family and friends, a well-designed deck can enhance your lifestyle and increase the value of your home. Check out these decking designs for inspiration and then contact your local Launceston deck builder – Krause Construction – for a free site visit and quote. Hardwood – the preferred option for durability, hardwoods such as spotted gum, blackbutt and forest red will withstand the extremes of the Australian climate. If your backyard is sloped, a multi-level deck will create different areas for cooking, eating and relaxing and increase the usable space in your garden. Steps can be added to draw guests towards certain features such as a pool or seated area. Multi-level decks are also a great alternative to expensive excavation works. Pergolas are ideal for entertaining areas. As well as being attractive, they can be covered to make your outdoor area functional whatever the weather. A pergola will also protect your furniture, bbq and other equipment (bbq, for example) from the elements. 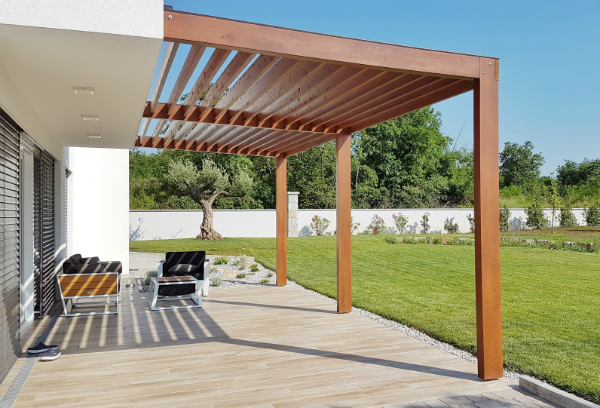 Don’t forget that all important shade a pergola will provide on hot summer days too!